Today I have a lovely original red velvet cake recipe for you. I call it original because I frosted it with ermine frosting. Many sources say ermine frosting is the traditional frosting for red velvet cake and not cream cheese frosting. Let’s get to it, shall we? This post contains affiliate links. For more information, please see my disclosure policy. When you level your red velvet cake, save the domes and crumble them for decoration. Pretty, easy, and tasty! 1 What Is Ermine Frosting, Anyway? 2 What Does Ermine Frosting Taste Like? 3 Is Red Velvet Cake Just Chocolate Cake with Red Food Coloring? What Is Ermine Frosting, Anyway? As far as I can tell, the origins of ermine frosting, or boiled milk frosting, are lost in the murky recesses of time. But it is made in the same manner that European buttercream is made in the sense that you make a base and then beat butter into that base until the whole is light and fluffy, impossibly smooth and perfectly spreadable. In European buttercream, the base is generally either an egg/sugar syrup base as in French buttercream or an egg white/sugar syrup base as in Swiss and Italian buttercream. Ermine’s closest buttercream relative seems to be German buttercream, which is based on an egg-and-starch thickened custard base. Lose the eggs, and you end up with ermine! My moderately educated guess is that someone or someones of German heritage moved over to the United States years and years ago, found themselves both in need of cake and with a shortage of eggs, so left the eggs out of their German Buttercream. And Ermine Buttercream was born. If you don’t like the look of a naked red velvet cake, make 1 1/2 times the ermine frosting recipe and frost the sides with a thicker layer. What Does Ermine Frosting Taste Like? Just because there was a shortage of eggs doesn’t mean there was also a shortage of butter. This frosting, while containing less sugar than standard American powdered sugar buttercream (7 oz as compared to 10.67 oz), also happens to contain a lot more butter (8 oz in this recipe as opposed to 3 oz or 4 oz of butter for the same size batch of American buttercream). Ermine frosting has a clean, neutral vanilla flavor that is just sweet enough. It doesn’t fight with the mild, slightly tangy flavor of red velvet, making it the perfect accompaniment. 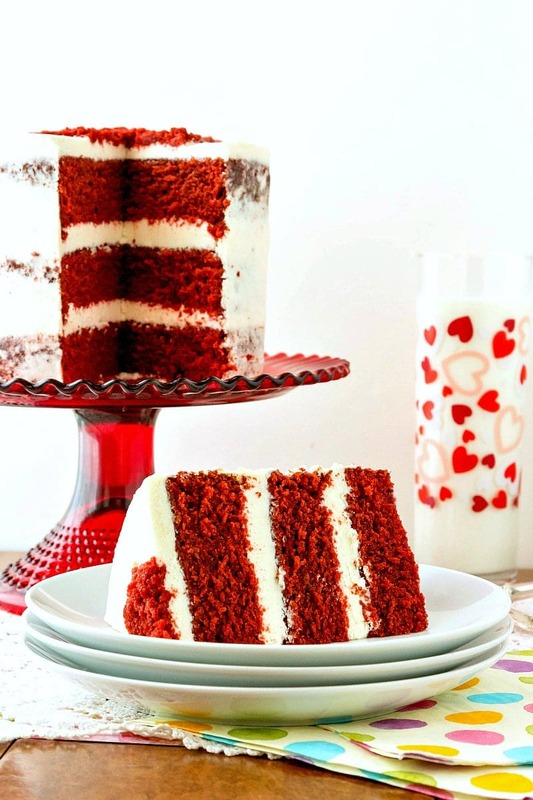 It doesn’t hurt that the white color also looks dramatic against the red cake. If you are used to pairing more assertive, tangy-in-its-own-right cream cheese frosting with your red velvet, give ermine a try. I think you will love the completely smooth texture and lovely mild vanilla flavor. Is Red Velvet Cake Just Chocolate Cake with Red Food Coloring? 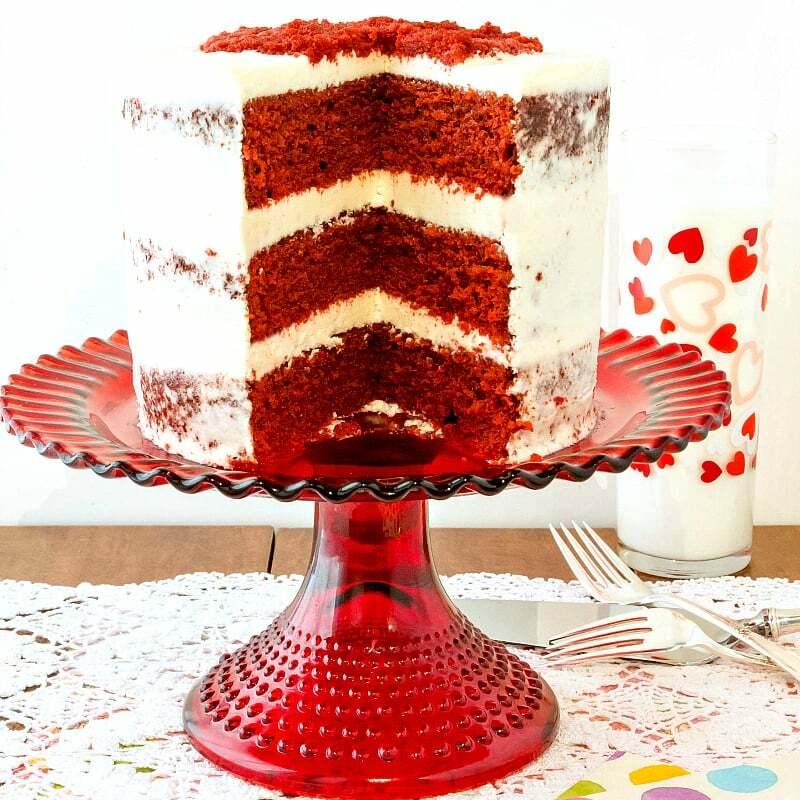 There are two schools of thought about the origins of red velvet cake. Some people say that the original red color was caused as a reaction between the acidic cocoa powder and buttermilk with the baking soda. So in that case, red velvet cake is a type of chocolate cake. 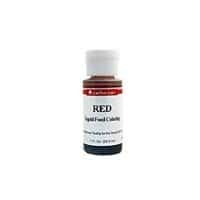 The other school of thought is that a food coloring manufacturer, Betty Adams of Adams Extracts, developed a cake recipe using red food coloring as an integral ingredient. This recipe contained cake flour and buttermilk for tenderness and just a hint of cocoa powder to keep the red color vibrant. You can find that red velvet cake, labeled as “original,” on the Adams Extract site. The recipe is described as being frosted with either “classic white icing,” or cream cheese frosting. Classic white icing=ermine frosting. Huzzah! So if you really want to make a traditional red velvet cake recipe, make sure to use Adams Extracts red food coloring in your recipe! Looking for more old fashioned cake recipes? Try my butterscotch cake. It is pretty spectacular, if I do say so myself! Red velvet cake with what is most likely the original frosting, ermine frosting. One bite, and you will save your cream cheese frosting for carrot cake! 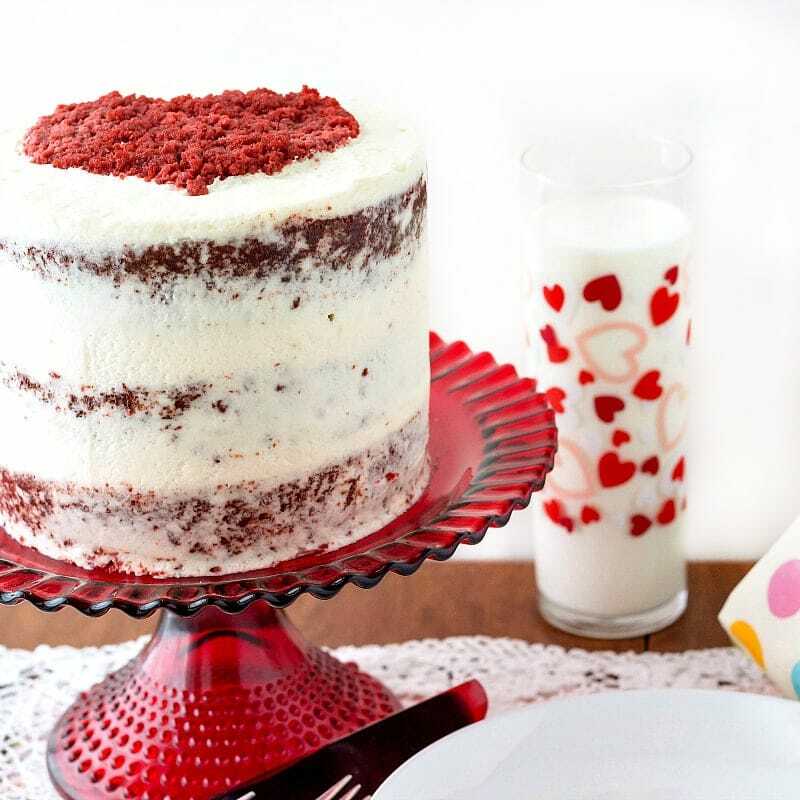 Traditional red velvet cake, at least as it evolved in the mid-20th century, gets its red hue from food coloring rather than from a reaction between cocoa powder and vinegar. The recipe does contain a bit of cocoa–just enough that you can taste it without it reading as a real chocolate cake. Red velvet also has a tender crumb courtesy of the buttermilk used in the recipe. For the tightest crumb, use cake flour. I used all purpose and nothing bad happened. 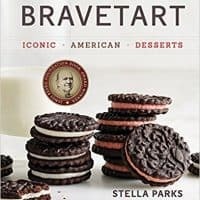 For an excellent discussion of red velvet cake (and excellent all-around recipes for desserts) check out Stella Parks’s wonderful BraveTart: Iconic American Desserts. If you like the sound of this recipe, please rate it and/or comment. I love hearing from readers! And if you make this cake, please share a picture on Instagram or in the Pastry Chef Online Facebook group. I can’t wait to see your version! Okay, now let’s bake this red velvet cake recipe and frost it, old-school, with the best frosting for red velvet: ermine! This original red velvet cake is the one I always made at the restaurant, although we paired it with cream cheese frosting. 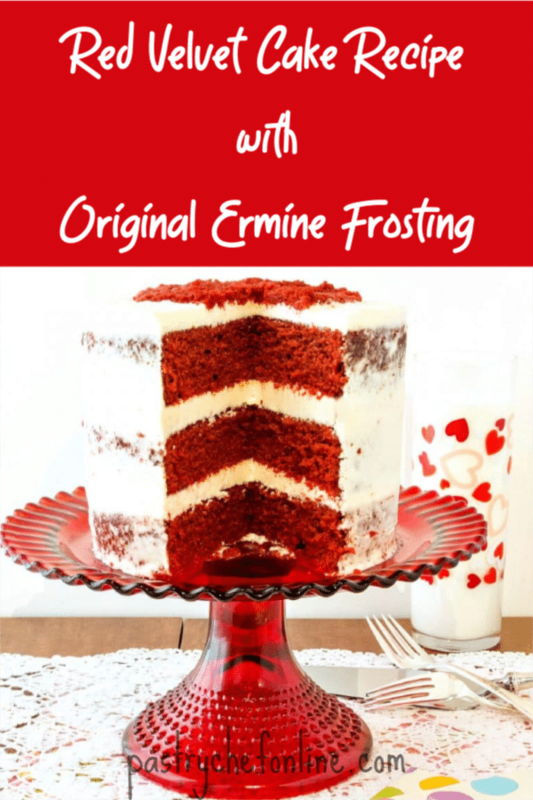 The ermine is perfect with it, so I recommend getting to know ermine frosting if you're a red velvet cake fan. 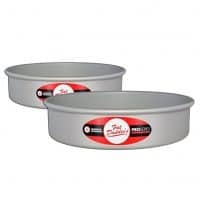 Spray 3 6" cake pans with pan spray. Line the bottoms with parchment circles, and place them on a baking tray. Set aside. Using the whip attachment, whip the butter into the cooled base a piece at a time, waiting until one piece is completely incorporated before adding the next. Once all the butter is added, whip on high speed for a few minutes (5-7 or so) until the frosting is smooth and fluffy. If it's still not coming together in a glorious fluffy mass, refrigerate the bowl for a few minutes and then whip again. Use the cake crumbs to decorate however you'd like, either pressing them around the sides or using them in a stencil to make a design on top like I did. Since the fat in this cake is oil, it will not get hard in the fridge. The butter in the frosting will get hard though, so if you refrigerate it, slice and then wait 30 minutes or so before serving so the frosting can soften up. And there it is, gang. 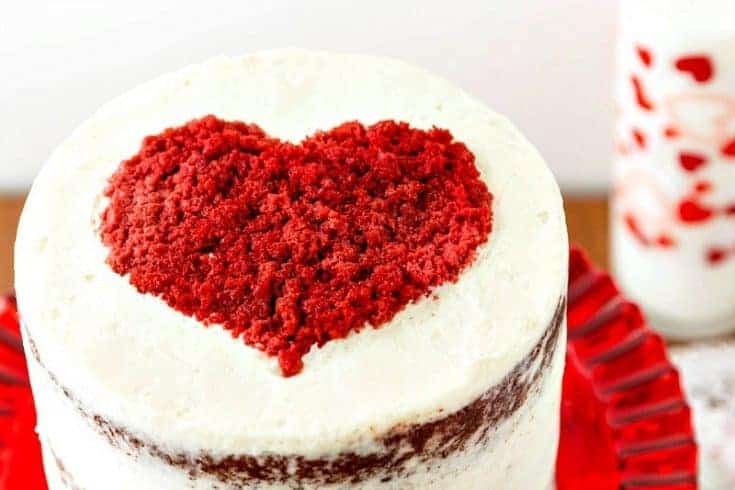 A Tender Red Velvet Cake Recipe frosted with beautiful ermine frosting. For my money, it doesn’t get more old school or more Southern than that, especially when you’re talking about cake. If you’re used to pairing cream cheese frosting with red velvet cake, ermine frosting will be a pleasant surprise. 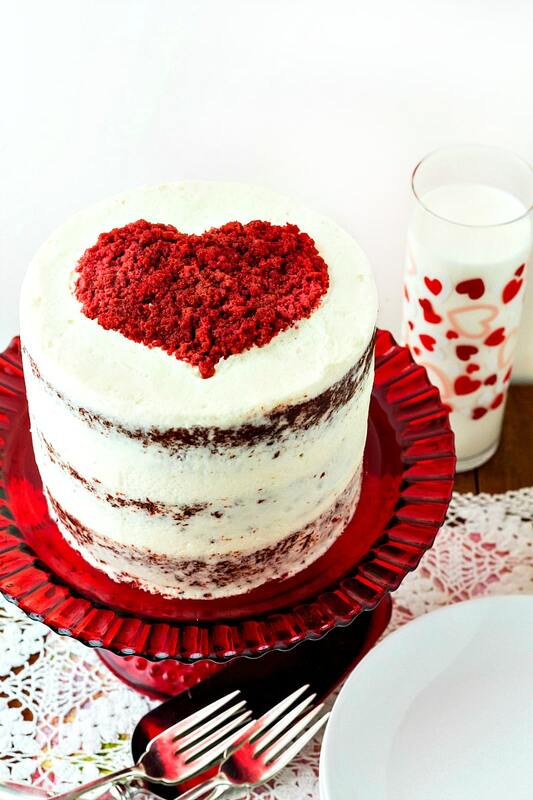 Make this red velvet cake for someone special, and see if you don’t agree. Ermine is also my favorite neutral (non-chocolate) frosting for chocolate cake. In case you were wondering. 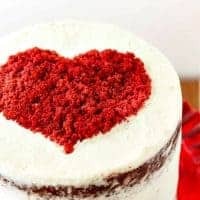 If you love this red velvet cake recipe, here are some other cakes on my site you might enjoy as well. Thanks so much for spending some time with me today. Enjoy the red velvet cake recipe and the ermine frosting. Take care, and have a lovely day. Dang, girl! You’ve outdone yourself! That is one gorgeous cake! Thanks, friend! It’s hard to beat the red-white combo for eye appeal, and I really *really* love the ermine frosting! Hello Jennifer, I just found your site doing research. I was raised on Red Velvet Cake. It was the “go – to” cake for every birthday and holiday in our house. I read Kathleen Klas’ comment and have just one difference. The frosting was never called “Ermine” frosting in our house. It was always called “Million Dollar” frosting. I read your recipe and it is exactly the same. I was born in the 50’s and have been cooking and baking for over 50 years. This recipe is not for beginners, if done improperly, you will taste the flour, and lumps will be prevalent. We cream the butter, sugar and vanilla with a whisk attachment and set aside. 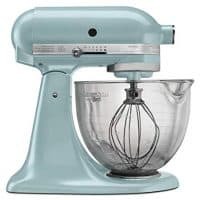 Next, we whisk together a small amount of milk and flour until there are no lumps, a paste, then we add milk, flour, milk, flour, milk, until it is all incorporated, having whisked the whole time. THEN, we put it on the heat, slowly bringing it to a boil, while whisking constantly. We would then remove from the heat, let cool and then whip together with the creamed butter sugar mixture. No sieving, no lumps, no flour taste. We would make the frosting the night before the cake, and keep it in the fridge. Just take it out before you start the cake and it will come to room temperature before the cake is ready to frost. Give this method a try and let me know. God Bless. Great information, Reverend. Thanks for stopping in. I love that you call it “million dollar frosting.” I used to call it “angel tears” frosting before I found it was called ermine, because it’s so good it would make angels cry! I am a total sucker for all things romantic. I love this cake and I am going to try to figure out how to make it gluten free for my family this Valentine’s day :-). Aw, how wonderful, Sandi! I don’t think it should be too hard to make gf. Even with the flour in the icing, you can sub cornstarch with no problem. 1 caveat: boil cornstarch-thickened pudding for a full 2 minutes, stirring all the while, or it will thin out again once it cools and you refrigerate it. Such a great recipe,I tried it and the taste was super delicious,the frosting incredibly yummy ,what to say,its the first time i try this frosting recipe ,never knew it before.But I have a question,the cake had lots of huge air bubbles, what causes this issue,too many big holes? What I did wrong? I used stand mixer ,and all purpose flour!! could this be the problem?thanks for your quick reply. 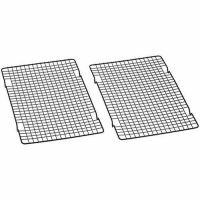 How would this work with 9″ cake pans? In my head it makes sense to just do two layers but I’m curious if it’ll mess with the baking time? It should work just fine, Megan. The baking time will probably be similar because even though there are only 2 layers, it’s the same volume of batter just spread out in 2 larger pans. Keep an eye on them and pull them once they test “done.” Enjoy! Red Velvet is a tradition in our family and we always did a white ermine icing but our icing is cornstarch and water simmered until thick then cool to room temperature, then powdered sugar creamed together with the room temperature butter and vanilla extract. then mix both mixtures together. I may have to try your icing recipe to see the difference. It is nice to see people out there who love the ermine icing like my family does. it drives me crazy when people think red velvet should have cream cheese icing! Yeah, I vote to save the cream cheese frosting for carrot cake, for sure, Janine! Your version of ermine looks even more old-school than this one–that cornstarch/water is so neutral, the main flavor would be butter. I’d love it if you would send the recipe. Would like to give it a try!